Coreeda is a combination of Aboriginal dance with a unique wrestling game. A team sport, it combines a three-segment dance component with a four-round combat element. When too many young men were dying from nulla-nulla fights and traditional spearing (both punishments for breaking the law) an Aboriginal elder sat by a creek and thought hard what else to do. Suddenly a snake appeared and told him: Look at the kangaroos! And it disappeared. The Aboriginal elder realised that the snake had been the Rainbow Serpent. So he went out as it had told him and watched the kangaroos fighting. He noticed that they were following certain rules. He introduced a similar technique into his traditional area, near Cobar, in New South Wales. Coreeda is divided into two components—coreeda dance and coreeda combat . The dance component, which is mostly based on traditional kangaroo dance steps, is the initial warm-up ritual and gives competitors an opportunity to display their abilities in strength, speed and agility. Divided into three segments, the idea is that the competitors can only touch the ground with their hands and feet and must stay within the boundary of a one-minute motion and has been likened in appearance to the Brazilian combat dance of capoeira. The third segment is more like a sumo match in which competitors try to push each other outside the circle or make the other touch the ground with any part of their body other than their hands or feet. The dance is important for determining which position the competitors will take in the combat component. 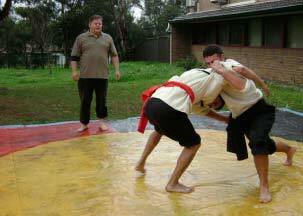 Coreeda combat is divided into four rounds, or quarters, each lasting a maximum of two minutes. The winner of the dance component can choose which position they will start with, inside the circle, known as the defender, or outside the circle, known as the attacker. The role of the attacker is to try and force the defender outside the boundary of the sun circle by means of pushing, throwing or rolling them, all within a time limit of 20 seconds. The role of the defender is to restrain the attacker within the sun for longer than the 20-second time count. Such a victory, known as a decider, ends the quarter, but a point score is collected during competition which is accumulated for the two minutes in case no decider is scored. Competitors swap positions each quarter and the point score is maintained until the end of the match. One other thing that differentiates coreeda from most other styles of wrestling is that it is a team sport and competitors add to the total team score with the points they have achieved in their match-ups. Teams are made of six competitors representing each of the weight divisions which are named after a species of macropod: Pademelons (60kg), potoroos (70kg), wallabies (80kg), greys (90kg), reds (100kg) and boomers in the open weight division. Teams are further divided into two moieties - black and red, which are the colours of the Aboriginal flag and the uniforms signify this. Aboriginal wrestlers Shane Parker and Stephan Jaeggi are promoting Coreeda in Australia. Coreeda is still relatively new and can be played armed or unarmed. It is said to be the traditional wrestling of Australia, as much as sumo is native to Japan, schwingen to Austria, ssireum to Korea, glima to Iceland and bokh to Mongolia. Coreeda is a fast and effective sport that builds reflexes, but also great fun to play. In this video Gavin Dixon gives a brief introduction to Coreeda and the traditional story behind it. The Coreeda Association of Australia is active on Facebook.